The hottest opening in L.A. is this family-friendly bistro in the Valley. 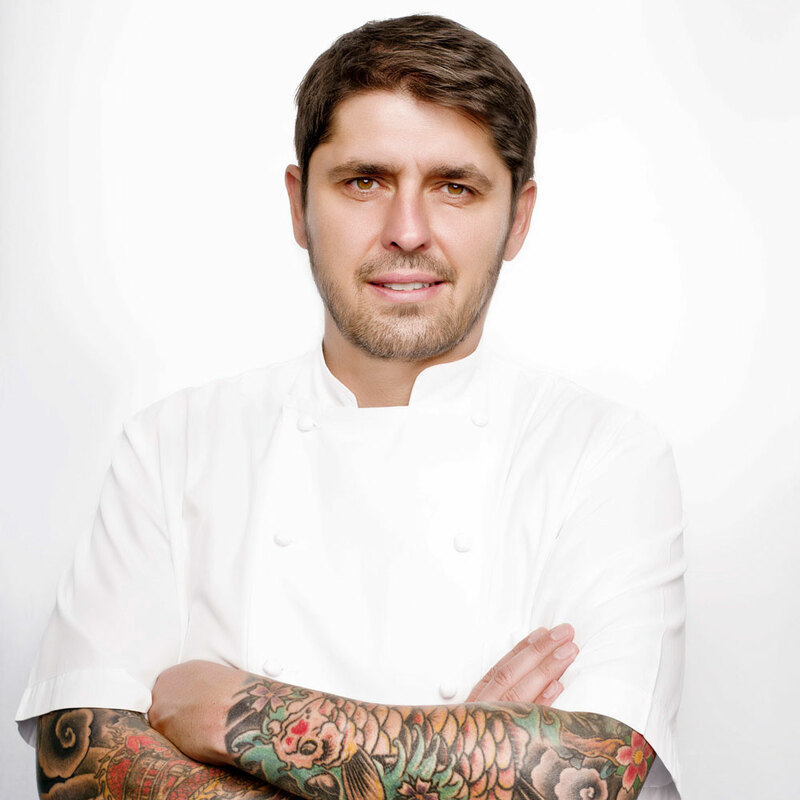 Ludo Lefebvre is sitting in the private dining room of his new Petit Trois on Wednesday morning, marking up what’s labeled as "V.7" of the menu with a ballpoint pen. This grand Sherman Oaks bistro, which opened on Thursday and has the makings of a game-changing all-day spot in L.A.’s San Fernando Valley, is by far his largest restaurant. There’s a lot at stake here, in the neighborhood where Ludo lives with his wife, Krissy, and their 7-year-old twins, Luca and Rêve. Ludo and his partners Jon Shook and Vinny Dotolo are deep in the middle of training and final approvals on this Wednesday morning. The health department will be here a couple of hours later for an inspection. 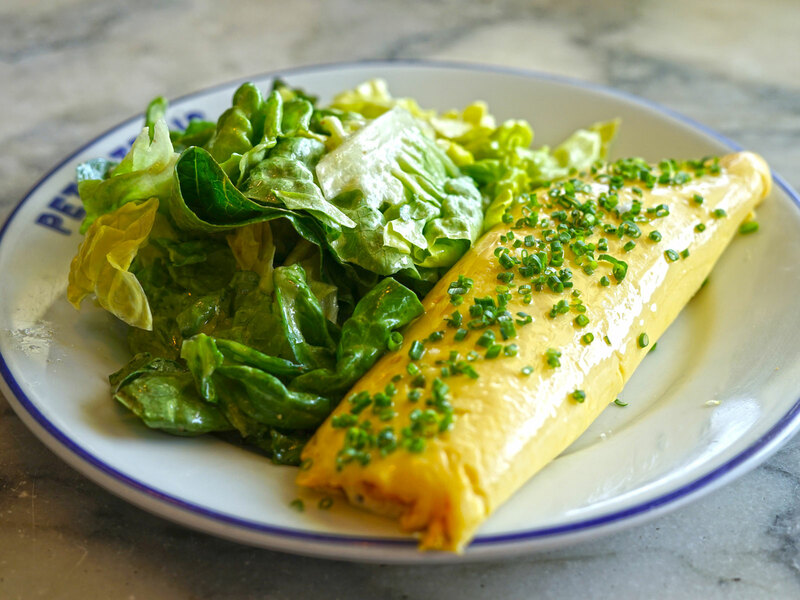 The restaurant is on the cusp of opening for breakfast, lunch, and dinner, but there’s still a lot to be done before this Petit Trois serves its first omelet to a paying customer. Part of the pressure this time around comes from wanting to meet the expectations of the neighborhood, which has been clamoring for a restaurant like this. It can be hard for Ludo to ride his bike to work without hearing someone yell his name. There are people all over the Valley, not to mention the rest of L.A., who are ready to visit this Petit Trois and who have a lot of questions about what to expect in Sherman Oaks. The original Petit Trois in Hollywood doesn’t have breakfast. What’s for breakfast in Sherman Oaks? Ludo’s famous omelet, of course. Tartines. Quiche. Pastries like beignets, croissants, chocolate croissants, canelés, and baked-to-order madeleines from pastry chef Rachel De Jong. “All the things you want to eat when you have a hangover,” Ludo says. In addition to a waffle with whipped cream and berries, there’s a ham-and-cheese waffle. Then he tells Krissy that their son, Luca, and their daughter, Rêve, are going to be upset because there are no pancakes on the menu. “We don’t do pancakes, because it’s not French,” Ludo says. Ludo wants Petit Trois to be a resolutely French restaurant. He wants the food to be like what he grew up eating in Burgundy, and he wants the experience to evoke his favorite bistro and brasserie memories in Paris. He wants to play the classics. His favorite dish on the breakfast menu is eggs meurette. The rich red-wine sauce takes about 12 hours to make. “It’s a French pizza with crème fraîche, onions, and bacon,” he says. “It’s just so good.” He grabs the pen and adds tarte flambée to the breakfast menu. Ludo, who also runs the fast-casual LudoBird fried chicken restaurants, says he’s “obsessed with chicken.” So at the new Petit Trois, he’s planning a garlic-roasted chicken with bread salad, asparagus, and shoestring potatoes. This dish is inspired by the chicken at L’Ami Louis in Paris. The plan, once things get more settled at Petit Trois, is to eventually have dishes like the sole and the chicken plated tableside. Another entrée Ludo is amped to serve is ham Chablisienne pasta, a dish he learned from his grandmother. Expect to see beef bourguignon and other new dishes very soon. “Trust me, I want to put more things on the menu because I’m so excited to cook traditional food,” Ludo says. But he doesn’t want to drive his team, including chef de cuisine Will Marquardt, crazy. So Ludo’s reining himself in a bit. Opening with more than 25 menu items for lunch and dinner is already impressive. The Valley is full of families. Should guests bring their kids here? So much of Ludo’s food is good for a child’s palate and desire for spectacle. For example, he’s doing a version of chicken cordon bleu where he’s putting ham and Swiss cheese fondue atop chicken breast instead of stuffing the chicken. The new Petit Trois has a kids’ menu with pasta and an omelet. On Wednesday morning, Ludo realizes that he should add steak haché, a chopped steak dish he loved eating as a child, to the kids’ menu. So he grabs his pen again. Krissy says the restaurant might add an after-school special with Nutella toast and a glass of milk. In France, an afternoon snack for children, known as le gouter, is a big part of the culture. Parents can drink wine while their kids fortify themselves. “As a parent, I have made sure that we have cups with lids on them for children because there’s nothing worse than sitting down and your kid accidentally knocks a glass over and it just destroys the whole meal for you because you’re so stressed out,” Krissy says. Dotolo, whose restaurants with Shook also include Animal, Son of a Gun, Jon & Vinny’s, Kismet, and Ludo’s Trois Mec and Trois Familia, points out that this Petit Trois is his restaurant group’s only space with tablecloths. But there’s paper atop the tablecloths. If your children want to draw something with crayons, that’s fine. Having tablecloths but also paper sums up, in a way, the goal of the new Petit Trois. It’s about making people happy, throughout the day, during both special occasions and casual drop-bys. Sherman Oaks and adjacent Studio City, after all, are well-heeled neighborhoods fueled by Hollywood-industry money but also by the desire of growing families to just relax and be themselves. The hope at Petit Trois is to have some guests come by for a mid-afternoon burger or just for tea or pastries or cocktails. Or you can bring your kids by for a plate of fries. So Ludo, Shook, and Dotolo also want to make it easy to have Petit Trois food as your family dinner at home. Every item on the menu is available to-go. Yes, this means escargot to go. Eventually, there will be family-style packages for at-home parties. Think refrigerated escargot by the dozen that you pop into your oven. Petit Trois also plans to offer delivery. How big is this Petit Trois? The main dining room seats 49 people between tables, banquettes, and the chef’s counter. There’s also a 12-seat bar. Plus, this is the restaurant group’s first space that includes a private dining room. That room can accommodate up to 35 and can be used for overflow on busy days. (For now, Petit Trois is capping its dining capacity to keep things manageable for its staff.) There will eventually be outdoor seating, in front of the restaurant, for 14. Plus, the Petit Trois team has a space next door. That could turn into a bakery/market. “Rêve’s already claimed a little candy store within it,” Krissy says. What ends up happening there will depend on how Petit Trois goes. If things get extremely busy, the team might need the additional space for prep or just to handle to-go orders. And Shook points out that there’s a space next to Jon & Vinny’s that’s only used for storage. Shook and Dotolo, who are working to open a Jon & Vinny’s in Brentwood and also looking for a Jon & Vinny’s location in the Valley, always have a lot to juggle. Ludo, similarly, has had recent days when he was in Sherman Oaks before going to cook dinner at Trois Mec. A big part of the partners’ success involves knowing what they have to focus on most at any given moment. So at this moment, the spotlight is on the new Petit Trois, with its Le Creuset cookware, its Global knives, its brass bar, its beautiful light fixtures, and its bright and inviting Hancock Design dining room with plush light-green banquettes. So it’s understandable that Ludo is a bit stressed on Wednesday morning. This is about everything for him: his past and his future and his neighborhood and his family and his legacy. OK, one last question: Ludooooo! When are you opening? Ludo hesitates as he takes in everything going on around him, in a restaurant he knows will soon be packed to the gills. It’s Wednesday, and he might open as soon as Thursday, but that will depend on how things go in the next few hours. He’s been working on this restaurant for two years. What’s another day or two? “For sure Monday,” he says, knowing he should manage expectations about his opening date. Petit Trois opened for breakfast, lunch, and dinner on Thursday, less than 24 hours after Ludo was marking up his menu in his private dining room. The place was getting jammed when I popped by a little before noon on Thursday. I sat at the bar and happily devoured the splendid ham Chablisienne pasta. There was a baby blissfully asleep in a portable seat that had been brought into the dining room. There was a well-dressed mom with a Louis Vuitton phone case and her two young, equally well-dressed and perfectly behaved daughters. There was a guy in a tie-dye shirt. There was a guy wearing a New York Giants cap who told a bow-tied bartender he’s upset because he’s moving to New York soon and won’t have Petit Trois as his go-to spot. There were multiple customers in shorts. There were some impressive combos of jeans and expensive shoes. Petit Trois was just a few hours old, and the come-as-you-are neighborhood was already flocking to its new all-day restaurant. I ordered a Paris-Brest to go, drove 10 minutes to my house, and enjoyed the dessert a few hours later. This day felt like the beginning of a new era in the Valley. Petit Trois in Sherman Oaks is open every day from 8 a.m. to 10 p.m.